From the Control Panel window, select View Network Status and Tasks. This opens the Network and Sharing Center window. 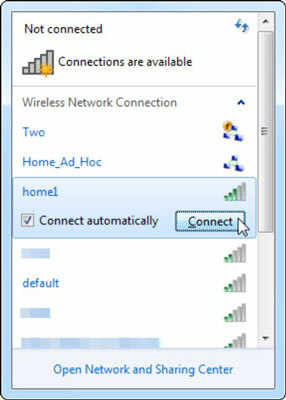 From the Network and Sharing Center window, select Set Up a New Connection or Network. The Set Up a Connection or Network dialog box appears. From the Set Up a New Connection or Network dialog box, select Connect to the Internet. The Connect to the Internet dialog box appears. From the Connect to the Internet dialog box, select Wireless. Your available Wireless Networks Connections window appears. You can also open this by clicking the wireless networks icon in your system tray. Right-click the wireless network to which you want to connect and then choose Connect. Alternatively, click the wireless network, select the Connect Automatically check box for quick connecting in the future, and then click the Connect button. The Connection dialog appears. 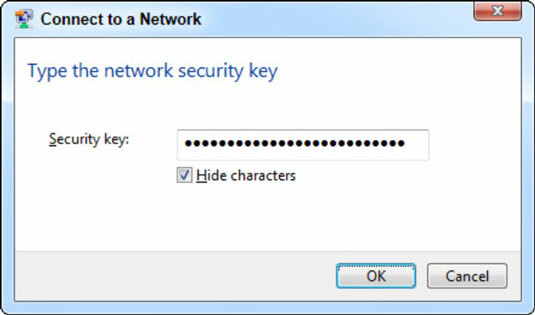 If the network has no security, you get connected; but if the network is configured for security, then you are asked for credentials based on those security settings. Provide the required information and click OK. When you are connected, you can tell by a lack of other icons associated with the Wireless Networks icon in your system tray. After you set up the connection, it will initially become active and will automatically connect to this network whenever it is in range. If you did not choose to save the connection, it will be removed from your wireless configuration when the network is out of range.